Zain, the Kuwaiti based telecoms giant may be sued over its use of the Zap trademark in Kenya. 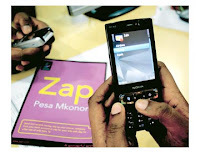 Zap is the flagship brand that is chasing Safaricom's 'MPESA' in East Africa's Mobile money business. Zain is challenged by Ngoko Enterprises, a small company trading in cleaning agents and has given the registrar of trademarks 14 days within which to respond to its notice, after which it intends to take legal action. This development is positive in as far as small firms are willing to assert themselves and protect their brand rights. It would be interesting to see what Zain would do if its use of the name Zap was deemed unlawful, either by the registrar of Trademarks or the High Court. The Zap challenge also underscores the importance of companies carrying out due diligence on trademarks before launching important products as such an oversight could lead be mortally fatal to the product. The other issue that arises is, if Zain is disrespectful of other companies' brands, why should the public respect its brand? !